When multiple teeth are missing in one arch, a partial denture may be the treatment option of your choice to replace the missing teeth. Partial dentures are removable replacement teeth that are held in place by small clasps that hold on to your surrounding natural teeth. Your natural teeth act as an anchor for the partial denture to stay in place. When teeth are missing, it can be very difficult to maintain a healthy smile. The adjacent teeth can move as they drift into the open space. This can leave the remaining teeth crooked, crowded and difficult to brush, which makes them more susceptible to decay and leads to eventual bone loss. A partial denture is an easy, noninvasive procedure. First, a set of dental impressions are taken of your mouth to record exactly how your teeth bite together. A dental laboratory uses the dental impressions to fabricate a model of your mouth and create your custom partial denture. 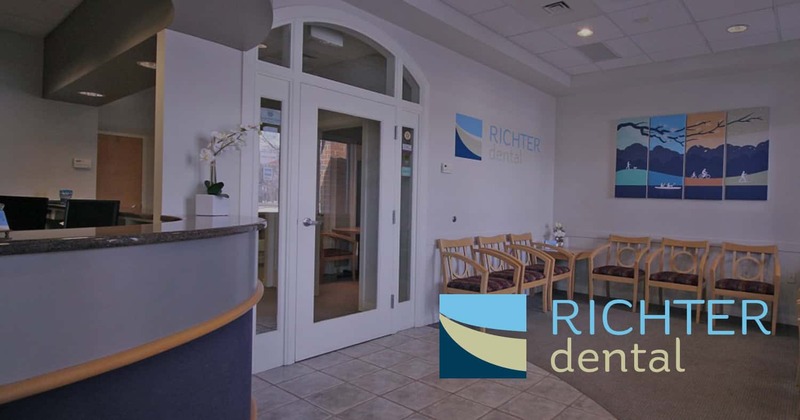 Once the partial is created, you will return to Richter Dental in Merrillville, IN to check its function and esthetics. Dr. Richter will make any adjustments that are required. It is common to have a few adjustment appointments and you may need some time before you are completely adapted to your new partial denture. Your dentist in Merrillville, IN will check your speech and adjust any spots that may be irritating your gums. Some patients require practice eating and speaking before they are comfortable with their new partial denture.